Happy New Year from Baranof and Company! We hope this letter finds you well and that you and your family enjoy a great New Year! The 2017 season was another remarkable season for us here at Baranof, with lots of fish caught and many friends made. As I sit here in the middle of winter, I get a get a twinge of excitement whenever I think of the coming spring and the chance to get back on the water doing what I love! As I think these happy thoughts, I have also become aware of some big changes in the fishing regulations here in Southeast Alaska for the 2018 fishing season. I thought I would share the changes, so you would know what to expect if you decide to book a fishing excursion here in Southeast Alaska for 2018. The changes mainly affect halibut and king salmon fishing. Rockfish, silvers and pink salmon, lingcod, and yelloweye rockfish are not affected by the changes, so you can expect to catch them with all the enthusiasm of the past fishing season. The halibut regulations are being changed in a big way in 2018, with the maximum keeping size being about 20 pounds. The king salmon forecast on the entire Pacific Coast is bleak, and the industry is bracing for what could be some very restrictive king salmon regulations coming for 2018. If you are interested in specifics on these two species, I’ve included more details below. The International Pacific Halibut Commission uses a reverse slot limit to regulate the catch rate of halibut. A reverse slot means fish of certain sizes cannot be retained. In years past, the slot limit has bounced between 42”-80” and 44”-80.” IPHC has set the 2018 slot to 35”-80.” What does this mean for us? Well, it means that every Halibut between 35” and 80” will need to be released. Worth mentioning is that while sports fishermen will be allowed to keep halibut over 80”, or around 275 lbs., fish this size are extremely rare in the Southeast - you’ll probably end up on the front page of the local newspaper if you catch one. So, for the 2018 fishing season, expect to fish for halibut under 35 inches. These halibut regulations extend from Ketchikan all the way up to Glacier Bay and include Juneau, Sitka, and Icy Point among other popular fishing destinations. The halibut slot changes every year, and it has been this restrictive in the past, so we are all hoping that the regulations will allow larger halibut to be kept in the future. The fact that the fishery in Southeast Alaska has been stable, allowing us to take fish out of a sustainable fishery, gives me high hopes that my kids will have the ability to fish for halibut many years from now. These new halibut regulations are in line with this concept of sustainable fishing, and while we may disagree with how the fishery is managed, it is a good thing it is being managed. As a charter captain, I could not do my job with a clear conscience if we were fishing a declining fishery. The logic behind the halibut slot limit is that females will grow much larger than males, and there is a direct correlation between a female’s size and the number of eggs she lays every year. Protecting these large breeding females allows IPHC to limit the total weight caught, while also protecting the females most vital to the halibuts’ spawning phase in an area. 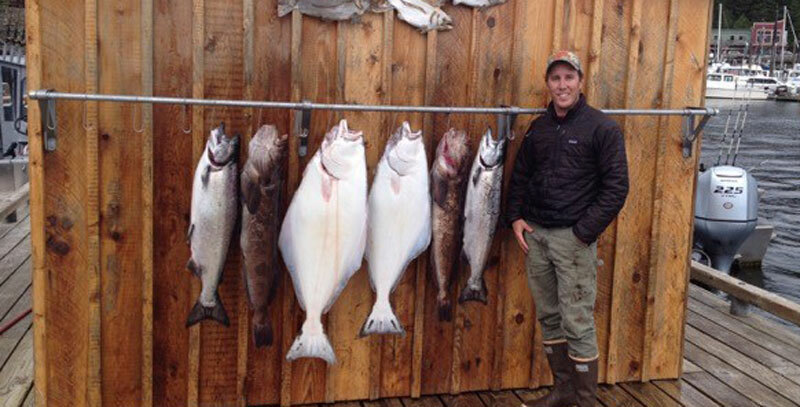 All halibut regulations on the macro scale are done on a weight basis in Alaska. The preliminary sampling of king salmon on the Pacific Coast in 2017 shows the lowest number in years, and biologists are not optimistic about king salmon runs in 2018. This is a complicated issue, as biologists and the IPHC are unable to distinguish between hatchery and wild salmon, and the variables controlling these runs are mindboggling. Still, the Southern Southeast Regional Aquaculture Association (SSRAA), which releases millions of salmon per year in the Ketchikan area, are expecting a lower than average but stable king salmon return for 2018. Bear in mind these predictions are often skewed or flat out wrong, and can often affect sport and commercial fishing differently. For example, 2017 was considered such a terrible year for returning king salmon that they closed the commercial trolling season. As a result, our company had the best king salmon year we’ve ever had because the power trollers weren’t out catching kings by the thousands. Though the king salmon and halibut situation are a bit disheartening, as a fishing guide, I am still optimistic about the upcoming season! Even if the halibut and the kings are limited, there are still plenty of fish in the area: silvers and pink salmon, lingcod, and yelloweye rockfish all make for an excellent day’s fishing, and the other rockfish species in the area ensure that in most any condition my customers are likely to catch fish. However, if you had your heart set on record kings or monster halibut in 2018, the chances of that happening in Southeast Alaska are extremely low. If that was your goal, I would recommend putting your trip on hold or perhaps look into guided fishing out of Seward or Homer, or self-guided lodges in remote areas like Point Baker or Elfin Cove. Self-guided anglers are not held to the same restrictions as guided anglers, so if you have the knowledge, it is also another option: I would love to help you plan if this is a route you would like to pursue. If you think that fishing for silver salmon, pink salmon, lingcod, rockfish, halibut under 35” and perhaps limited king salmon sounds great, please book for the 2018 season! However, if you feel that that halibut and king salmon regulations are going to prevent you from having a good time with us, we encourage you to pursue other options. We see no benefit in booking clients we’re unable to make happy. If you have already booked and would like to cancel your trip, please contact Bonnie and she will give you a full refund. If you would like help looking for other options or if you have any other questions about these regulations, please contact me directly. Thank you very much! I look forward to fishing with many of you in 2018!